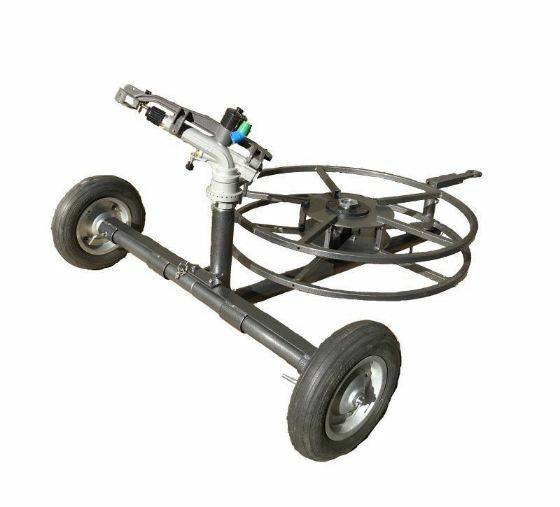 DuCar Atom 40 with 2" Heavy Duty Wheeled Cart and Intergrated Hose Reel High Volume - Long Throw Impact sprinkler! This highly efficient sprinkler rotating in full or part circle, is an impact sprinkler operating at medium pressure (2.0 – 5 bar). Thanks to replaceable sprinkler nozzles and adjustable breaker, it ensures you to irrigate your field with minimum water and excellent uniform water distribution. It is excellent for agricultural, mining, dust control, stationary and portable systems. This model has aluminium main body with rotating mechanism of lower body made of brass, Teflon and stainless steel. It is equipped with specially designed and adjustable breaker. Lower body is specially designed for sandy water. Also its specially designed breaker has licence certificate. It has a second nozzle outlet that can be plugged at low pressure. With its specially designed low body angle made of Teflon and brass, this product may also operate with waste water.